Sherman has sent out a members only e-newsletter today. Check your email inbox! If you think we missed you, drop us a line at info@papcg.org. Class registration for Melanie Muir’s Master Class March 9 & 10 is now open for existing Guild Members only. The PayPal link for Master Class $200 registration fee is in the e-newsletter members received today. This class will be popular and space is limited. Please register using the PayPal link in your e-newsletter and get ready for an amazing class. Not a member now? Don’t worry. After our current members have a chance to register, any remaining places in the class will be posted at the end of the month. The cost for non members will be $240 which includes our $40 dues. So members, register today and learn Melanie Muir’s techniques and her secrets of beautiful construction. 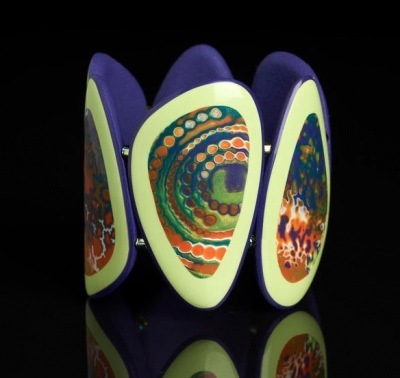 In the meantime, enjoy one of her bracelets (below) and explore her work at http://www.melaniemuir.com.